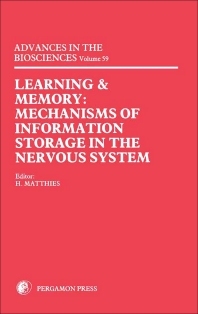 Learning and Memory: Mechanisms of Information Storage in the Nervous System contains the proceedings of the Seventh International Neurobiological Symposium held at Magdeburg on October 28 to November 2, 1985. Organized into four sections, this book first elucidates the synaptic long-term potentiation. Section II explores hippocampal functions, and Section III describes the biochemistry of memory formation. The last section addresses the principles and modification of learning behavior. Postsynaptic Depolarization, a Necessary Condition for Development of LTP? Do Casomorphin Peptides Influence Consolidation Processes? How are the Events at the Molecular and Neuronal Levels Connected with Learning and Memory?